This week in fashion, Beyonce’s Vogue September issue is revealed, Gucci opens its e-commerce site in New Zealand, and Sportsgirl launches an empowering new campaign. Find these stories and more as we reveal this week’s top international fashion news. Since news dropped in July that Beyoncé would be given unprecedented control over Vogue’s September issue, we have eagerly awaited its arrival. In our first look at the highly anticipated mag, Beyoncé has shared two of the potential cover images on Instagram. Shot by the magazine’s first-ever African American photographer, Tyler Mitchell, one cover shows Queen B rocking an extravagant floral headpiece and simple white dress. The other shows Beyoncé in a bright layered dress posing outside. The captions to both images read: “Everyone’s voice counts,” and “Beyoncé in her own words.” Beyonce also shared a series of other photos which will also be included in the fashion mag. 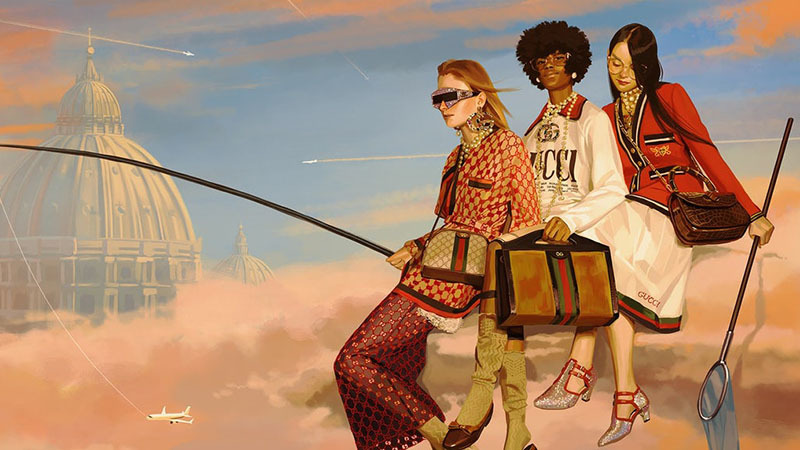 Gucci has officially launched its e-commerce site in New Zealand. This means customers can now shop the Italian fashion house’s full range from the comfort of their own homes. The digital space includes everything from the brand’s ready-to-wear collections to its handbags and shoes. Seeking to provide customers with the ultimate online shopping experience, the site is also complete with a stories section. This space is to inform and educate consumers on everything from the history of Gucci to past collections. Held in Fox Studios Sydney, David Jones Spring/Summer 2018 show gave us a sneak peek of the latest fashion trends. Modelled by David Jones ambassadors Victoria Lee and Jessica Gomes, as well as local star Adut Akech, pieces spanned from activewear to everyday office attire. Supermodel Karolina Kurkova and Anwar Hadid also strutted their stuff in the show. Drawing a huge A-list crowd, the bi-annual fashion launch is one of the most anticipated fashion events in the country. Arguably one of the biggest drawcards of the launch is the spring racing attire. Expect midi-length cocktail dresses, incorporating feminine silhouettes and bold colour-blocking. As for day to day, trends include neutral linens, wide leg pants and draped shirts and even a few Western-inspired looks. Labels included Bianca Spender, Bec and Bridge, Camilla and Marc and Dion Lee just to name a few. Sportsgirl’s latest campaign is a manifesto to inspire and empower women from all walks of life. The “Be That Girl” movement features 12 incredible, talented and unique Australian women. The series includes the likes of trans model Manahou Mackay, Paralympic snowboarder Joany Badenhorst and Indigenous Australian youth activist Aretha Brown, DJ and cool-girl FlexMami and TV presenter Carissa Walford. Centring around self-love, the campaign shares these women’s stories in a bid to inspire others to be confident, capable and strong in their identity. The campaign imagery is also raw, real and completely unretouched. Be That Girl wants to demonstrate there’s no such thing as perfection. The retail chain is inspiring Australian women to be themselves, whoever that may be.